There are seventeen candidates ready to fight it out for the beauty queen title. But this election is not quite like the others. 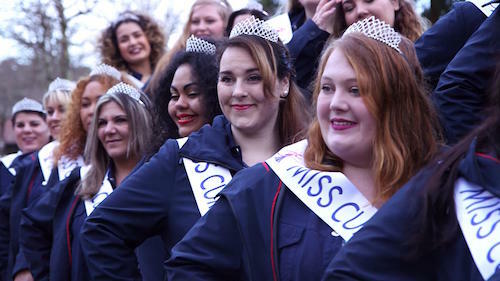 Miss Midi Pyrénées, Miss Limousin or Miss Langeudoc Roussillon are competing to be chosen as Miss Curvy, the Miss with the generous form. Here, there are no limits on size, weight or ideal measurements: the only criterion is to be a minimum size 12 US (as are 60% of French women). The competition is the embodiment of the movement started in the USA: the “body positive”, in other words: accept your body, whatever it’s shape. But whether you’re round or not, a beauty contest is a big sweat! Over two days, our Misses will put on dance routines to present a show packed with rhinestones and sequins. The election night is held in the Mezos cabaret, one hour’s drive from Bordeaux. A music hall temple, expertly managed by Gérôme and Romain. However, in addition to directing the cabaret and managing the evening, these lovers of feather and fandango also go on stage! Along with the competitors, the organizers and the families who come to support their Miss, we follow the backstage race for the winner’s sash. At the end of an exceptional show, there can be only one winner… a wealth of symbolism.